“Mayor Muriel Bowser joined Eastbanc, Inc. and Stanton Development to break ground on Hine School Redevelopment, a $224 million project in Ward 6 that will complete the corner of 700 Pennsylvania Ave. SE, with mixed-use development that includes retail, affordable housing, and a new public plaza. The redevelopment of the Hine School site is expected to generate nearly 2,500 construction period jobs and over 700 permanent jobs. Once completed, annual new tax revenues of $5 million is expected. The Hine Redevelopment will deliver nearly 60,000 square feet of retail space – with 20% reserved for local tenants – 180,000 square feet of office space, and 327 parking spaces. Additionally, the development is also expected to provide 162 apartments, which will include 46 affordable housing units, with 17 of those units set aside for seniors. 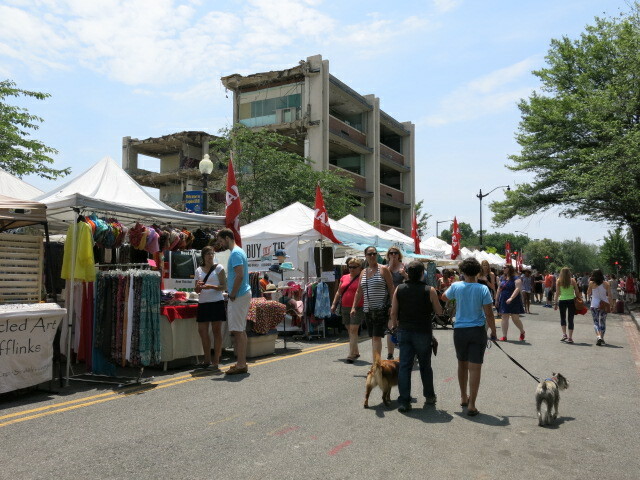 During construction, the popular Eastern Market Flea Market will continue to operate on Saturday and Sunday on 7th Street, SE. Once construction is completed, the flea market will operate on the new C Street, SE and public plaza on weekends. Also, the Hine Redevelopment project’s commitment to sustainability includes a LEED-certified design, green roofs, car-sharing and underground bike racks. Over the next month, workers will begin excavating the site and by the end of the year concrete work will commence. Delivery of the entire project is expected in 2017. Why Won’t Food Trucks Show More Love to Silver Spring?